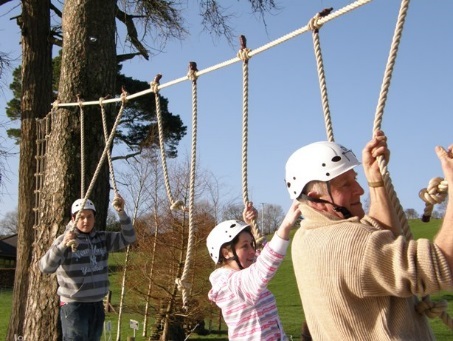 The Orchard Centre’s Low Ropes Course is an aerial obstacle course strung among the existing giant Spruce and Beech trees using cables, ropes and beams. Teams will explore risk taking, leadership, communication, problem solving and coaching during this adventure. The elements of the course are close to the ground so the perceived risk is low, but still quite challenging and physically demanding. 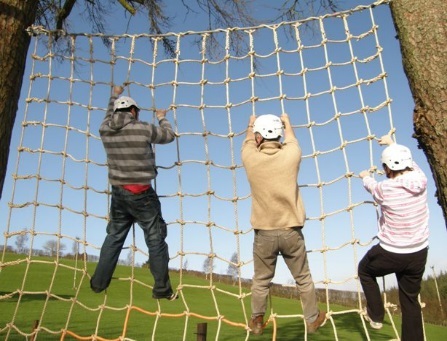 The team walk along tightropes, negotiating their way through different obstacles, while also climbing a cargo net. Each member of the team will gradually find themselves expanding their comfort zones and recognising fears that may block their personal and professional achievement. Most elements of the course will require team-mates to actively support and encourage one-another. 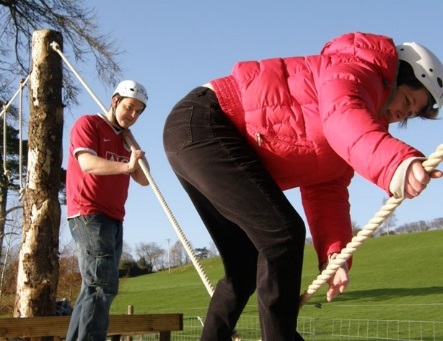 The Orchard Centre’s low ropes course programme is designed to focus on personal achievements and ask participants to confront their personal fears and anxieties. Challenges are physical and emotional. The low ropes programme is designed to explore group interaction, problem-solving, and leadership. In particular the programme can help teams with cooperation, decision making, self confidence, positive risk taking, cohesion, trust, self esteem, leadership, goal setting and teamwork.